All items are mint (or in near EX/perfect conditions, about the used stuff); prices in €uro, postage NOT included. Pictures available upon request; NO time wasters. At the moment I absolutely need to sell, so NO TRADES (can be there only very very rare exceptions, and ONLY for some of items in my want-list). By the way, NO TRADES with my rarest stuff(except where indicated), so please DON'T ASK!! NELDORETH(Ita) – Neldoreth Mini C.D.2001/2002 Sealed – 2,50 (buying this you'll get also "Peghera"
VV.AA. -"Fullmoon Light distro sampler"(Vol. I) [Compilation C.D.-r] - Free! & TONS more dubs; if interested just ask. * ETERNAL FUNERAL(Ita) - Brixian warriors (debut self-released C.D. 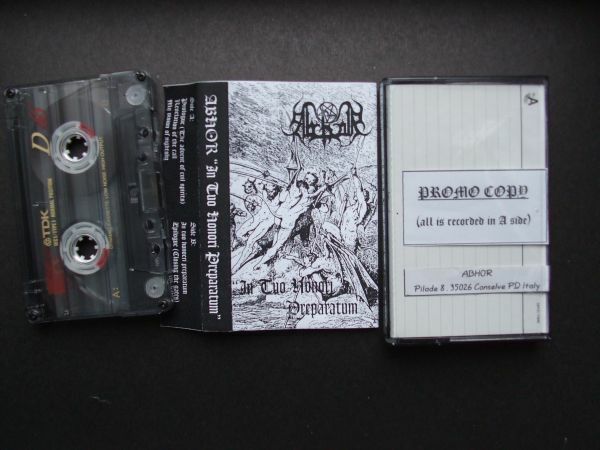 1999) + promo-tape '97 "Wanted War"
* SORORICIDE/CHORUS OF RUIN - Split C.D./E.p. * NOCTILUCA(Parma,Italy)-Demo '01 + self-released CD '08 "Back to the soul system"
* NORTHERN TOD(Ita) - Ask! AZAGHAL (ALL demo covers),FLEURETY - Black snow(the RED one...),Maze Of Cako Torments (any! ), VLAD TEPES (any! ), KVIST-Demo '94, STRID - End of life(Reissue), Black Hole(Italy)-demos '83,MANES-Til Kongens grav de dode vandrer (Promo-demo '95), Peste Noire - Macabre transcendance, Chätiment - Demo 2012, SETHERIAL-Demo '94,Thule (pre-TAAKE)-Demo I('93),Lunar Aurora-Demo '95 (D. #1),WIGRID - Ort des einsamkeit, The GATHERING - Moonlight archer, ONE TAIL ONE HEAD - Demo II, Gorgoroth - Promo '94, Malign(Swe) - Demo '95, BLACK GHOST(Italy)-When the heart rules the mind (Demo#3 - 1987) XEROXED COVERS only! 2001),I don't care if it's just a copy from the original cd-r...anyone who can help me to find this ultra-rare release please send e-mail or PM! TRADES strongly preferred! !By the way, if you want to sell any of these items you must know your price! So don't waste your time sending any "make an offer" msg...otherwise you'll be ignored! Thanks. Last edited by obscure plasma on Wed Apr 03, 2019 5:28 pm, edited 470 times in total. UPdated once more! Added some hard-to-find old CD's....and last but not least THANKS to ChristosP for the perfect trade & feedback!! UPDATED, Handful of Hate c.d. SOLD OUT! Le ORME, MOTHER'S FINEST, PUISSANCE and SPITE EXTREME WING c.d. 's GONE. UPDATED! Some wants added, check out my first post!!!! UPDATED! MULTIPLEX e.p. 7" gone.